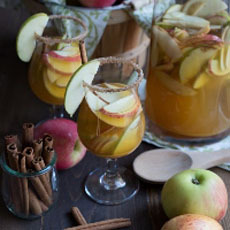 Celebrate fall with Apple Cider Sangria. Photo courtesy Zulka.com. Sangria is a popular party drink, and you can moderate the amount of alcohol or use none at all. Here’s the version we’re serving at Thanksgiving, compliments of Zulka Sugar. Fall is apple cider season, so Instead of fruit juice, this recipe uses apple cider and sparkling apple cider. Cider s available in alcoholic and non alcoholic versions. In the U.S., alcoholic cider is known as hard cider. (See details below.) Find more delicious recipes at Zulka.com. 1. COMBINE the cinnamon and sugar in a small bowl. Pour a little of brandy in another small bowl. Dip the glass rims in the brandy and then the cinnamon sugar. Add a few apple slices to each glass. Set aside. 2. ADD the remaining cinnamon sugar to a large pitcher. Add the apple cider and stir until the sugar is dissolved. Top with the brandy and wine and mix. Add the rest of the apples. Chill until ready to serve. 3. ADD the sparkling cider right before serving. Garnish with an apple slice and a cinnamon stick. Serve chilled. Add ice if desired. While in the U.S. and parts of Canada, the term “apple cider” is interchangeable with apple juice, in Europe a glass of cider is not kid stuff: It’s an alcoholic drink that many prefer to beer. One of our favorite cider brands. Photo courtesy Crispin Cider. Usually made from fermented apple juice (although pears can be used—pear cider is known as perry in the U.K.), the juice ferments for eight weeks after the apples are pressed. 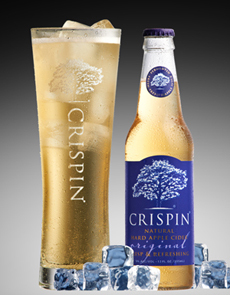 The cider then matures or several months, is blended, filtered and carbonated. The result is a drink with the carbonation and alcohol of beer and the flavor of apples. As with beer, each brand has a distinct flavor profile and alcoholic content, generally from 3% ABV (alcohol by volume) or less to 8.5% or more. In the U.S., alcoholic cider is called hard cider, and it’s becoming more popular. Like wine, it has a relatively high concentration of antioxidants—but enjoy it for the crisp, refreshing taste! Hard cider is best served chilled or over ice. Cider is less filling than beer. The apple flavor is all-natural (as opposed to artificially-flavored malt beverages).